We're friendly guys! (With a good sense of humor!) Please do not feel shy about contacting us regarding training opportunities if you think this is something for you. 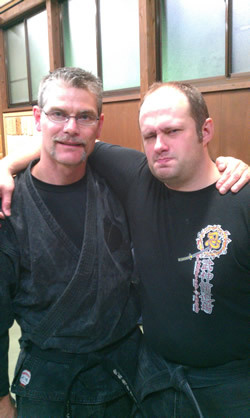 For other Bujinkan dojos in other areas please see our "Links" page on the Navigation Bar above. But please read my small "rant" on the index page first! To know that patience comes first. To know that the path of mankind comes from justice. To renounce greed, laziness, and obstinacy. To recognize sadness, worry, and resentment as natural and to seek the immovable heart. To not stray from the path of loyalty and brotherly love and to delve always deeper into the heart of budo pursuing the ways of both the literary and martial arts with balanced determination. 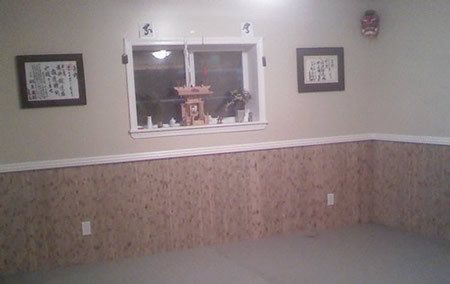 Our home dojo is a small classroom suitable to our needs. We utilize mats, lighting and privacy for much of our practice sessions. At other times we venture outdoors to allow the experience of varied terrain, lighting, and weather to augment our training. I have no desire for a large numbers of students, but merely a few dedicated people willing to help each other along the martial path.